This was meant to be a new era for Sudan. Last year the United States ended two decades of sanctions that President Omar al-Bashir had long blamed for his country’s poverty and isolation, a move that promised new investment, perhaps even an economic rebirth. But when Mr. Bashir then ended fuel and wheat subsidies, at the suggestion of international lending partners, protests broke out. And over the past week, festering public anger compounded by nearly 30 years of frustration over corruption and economic mismanagement has grown into demonstrations so big and widespread that some say they could topple Mr. Bashir’s military government, or at least seriously challenge its legitimacy. Sudan, a predominantly Arab country on the edge of sub-Saharan Africa, entered its sixth day of protests on Monday, with more planned later this week, including a mass procession to the presidential palace, an elaborate Chinese-built complex opened only three years ago. Monday’s demonstration, organized by doctors, followed days of violence during which security forces fired tear gas and at least nine people were killed, according to Amnesty International. Local journalists put the death toll much higher, saying up to 28 had perished in clashes. The authorities have arrested 14 leaders of the National Consensus Forces, an opposition coalition, according to news reports citing its spokesman. The government has shut down internet service and social media sites, as well as universities and schools in the capital, in an apparent attempt to dissuade people from joining the protests. Protests had begun spontaneously and without apparent leaders, he said, but now, people were organizing themselves into a movement. A government spokeswoman said she would comment on the protests, but subsequent calls went unanswered. 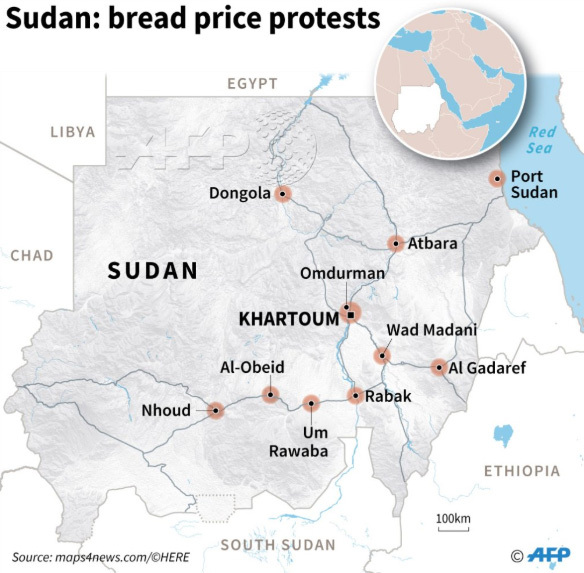 Many Sudanese have described hundreds of people lining up just to buy bread, withdraw limited amounts of cash — their salaries — from bank machines or sleeping in their cars for two days waiting to fill up on petrol. Inflation has been so rampant, reaching an annual rate of 70 percent in November, according to government data, that many ordinary Sudanese can no longer spend money on meat or fuul, a staple food made of cooked fava beans. Some people now spend 40 percent of their income just on bread, Mr. Mohamed said. 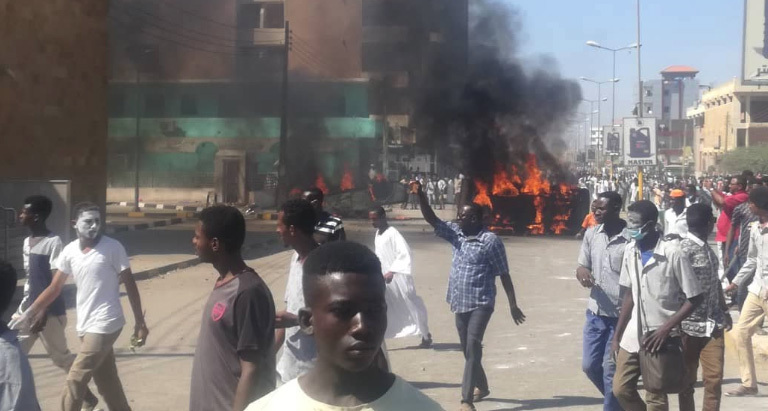 Sudan has a long history of street uprisings, two of which brought down the government. Recently, the country saw protests over rising fuel and bread prices in 2013 and earlier this year, but they were largely contained in the capital and snuffed out by the security forces. 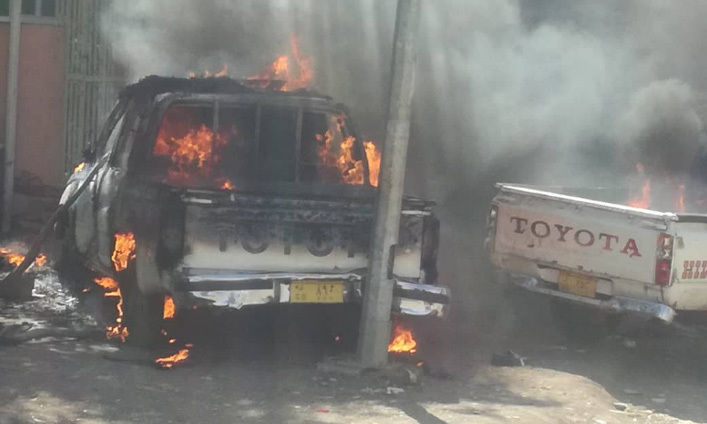 This time, the protests started in the eastern city of Atbara, a former locus of anticolonial and union activity. The demonstration then quickly spread to half a dozen cities. Last year’s lifting of American sanctions came as the Trump administration said the Sudanese government had made progress on a number of issues, including counterterrorism. The State Department also said the government had stopped attacking civilians and had improved in allowing humanitarian aid to reach troubled regions like Darfur, where Mr. Bashir’s government stands accused of massacring hundreds of thousands of people in a genocide starting in 2003. Washington said the country was also curbing its destabilizing activities in neighboring South Sudan, which split off as an independent nation in 2011. Sudan is also playing a central role in the United States-backed war in Yemen. 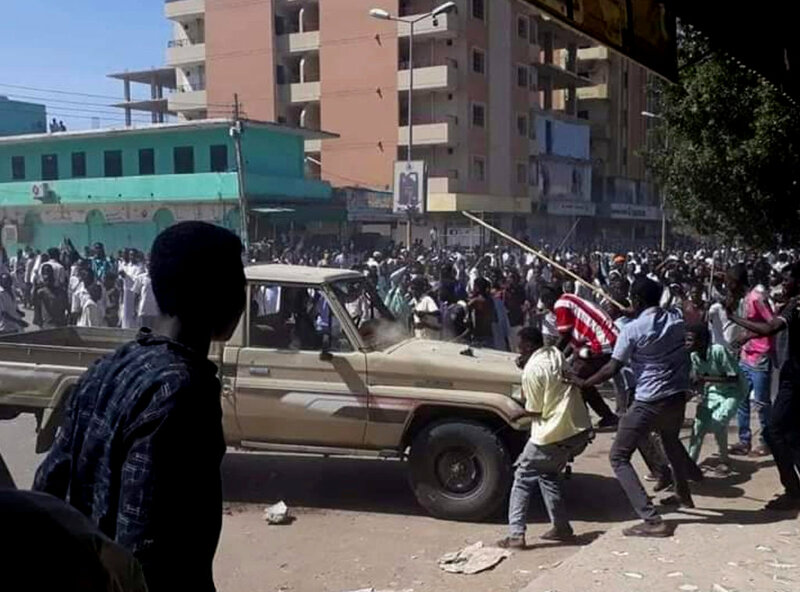 But the United States is still keeping Sudan on its list of terrorism sponsors, which means it will not be granted debt relief, a major drag on the economy. The International Monetary Fund sent a team to Khartoum in July, and Sudan has started a series of reforms and austerity measures in line with its recommendations, including the removal of subsidies, to try to bolster the economy as it struggles with high inflation and a shortage of hard currency. The monetary fund has not yet agreed to a loan — one could follow further down the line — but has committed to technical assistance. “They thought they could address the economic crisis but could not foresee the political reaction” that the effort would cause, Mr. Mampilly said. In part, Sudan is still suffering from South Sudan’s decision to secede, taking with it nearly 75 percent of Sudanese oil reserves. Until the secession, oil revenues consisted of more than half of Sudan’s revenues, said Mr. Soliman, and about 90 percent of exports. But the larger problem, many Sudanese say, is that Mr. Bashir’s government, in power since a military coup in 1989, has not made any significant investments in infrastructure, agriculture or its people, though it has promised to build a museum recording the malign effects of American sanctions. Only 7 percent of the national budget goes to the health sector, for example, compared to 75 percent to defense, security and salaries and perks for senior officials, said Mr. Mohamed, of Justice Africa. The elite has stolen a lot of the wealth too, he added, an accusation government officials have denied in the past.